GannonMedia necesitaba un nuevo diseño de botón o icono y lanzó un concurso de diseño en 99designs. We have a cornerstone content piece we need to highlight (along with its sponsor) as well as pointing out an award our magazine received. This contest has been clarified from an earlier entry. 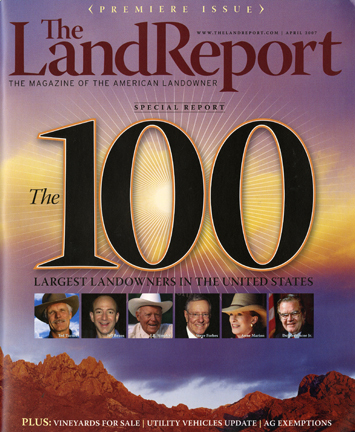 -We need a Land Report 100 logo for specific use on the site and possibly in print materials. We also use that 'logo' on our home page to link to that piece of content. We need a new button to put in its place. Using an adaptation of the logo above, please create a button to use on the home page. The button has to 322px wide, but take some freedom with the height. Please when designing the button for The Land Report 100 be sure to take into account the color scheme of our current site. As an aside, we also have a minor second request. We need a badge to tell of an award we received. It's like those gold foil stickers you got in grade school, pointing out that our magazine was named one of the 15 Hottest Launches in the Country for 2007. Another magazine -Garden and Gun- was named to the same list. You can see how they promote their award at gardenandgun.com. We'd like something similar but it has to fit into our color scheme at landreport.com. Take some creative license with the site and how we could best integrate the award badge into our header image. This just an addendum to the contest and we dont feel it requires its own contest. - Variety is good but please try to keep with an 'earthy' tone for colors or muted reds, blues, purples etc. Something that's way to busy. It should be simple and to the point. Web 2.0 styling isn't necessary, no bubble letters etc. Classic styling.